﻿ Hoang Quan Hotel, Da Nang | FROM $13 - SAVE ON AGODA! "It is a convenient place to stay." Have a question for Hoang Quan Hotel? "I stay this hotel room is good." "We were here for less time but then we enjoyed the stay." 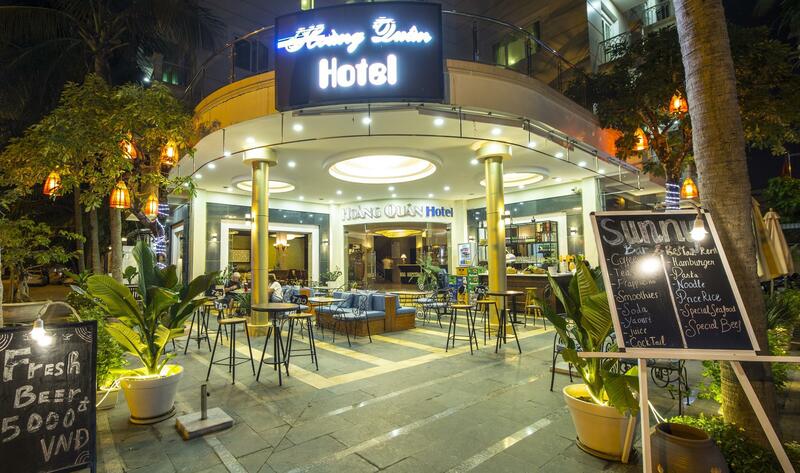 If what you're looking for is a conveniently located hotel in Da Nang, look no further than Hoang Quan Hotel. The excitement of the city center is only 5 km away. For those of you who want to venture out, Benh Vien Phuc Hoi Chuc Nang Da Nang, Bac My An Beach, Bac My An Market are just some of the attractions available to visitors. At Hoang Quan Hotel, every effort is made to make guests feel comfortable. To do so, the hotel provides the best in services and amenities. While lodging at this wonderful property, guests can enjoy 24-hour room service, free Wi-Fi in all rooms, 24-hour security, daily housekeeping, fireplace. In addition, all guestrooms feature a variety of comforts. Many rooms even provide television LCD/plasma screen, carpeting, slippers, towels, closet to please the most discerning guest. Whether you're a fitness enthusiast or are just looking for a way to unwind after a hard day, you will be entertained by top-class recreational facilities such as sauna, spa, massage, garden. 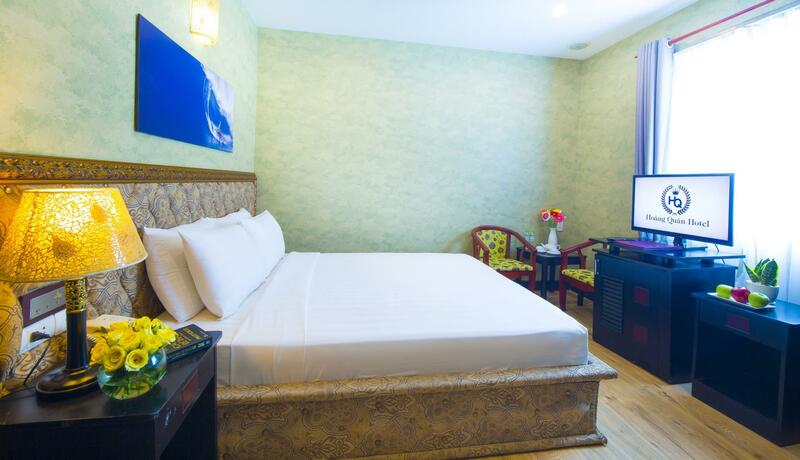 With an ideal location and facilities to match, Hoang Quan Hotel hits the spot in many ways. "Amazing hotel and good rooms." We only stayed at the hotel for a night. The location is easily located . It is a convenient place to stay. There are restaurants and eateries nearby, but lack a shopping mall. The room is small but clean and comfortable. my room got upgraded and it was just huge with everything you need, looked also quite noble, but in fact some things especially in the bathroom were not so clean, the windows even sticky. during my stay the hotel was full of noisy Chinese tourists. Went to the breakfast around 8.30, a nice choice of dishes and fruits. The beach is only 5-10 minutes walking distance. Be aware that the real city center is far away. Amazing hotel and good rooms. definitely value for money. We were here for less time but then we enjoyed the stay. Friendly staff, good location but poor wifi in room. Great location. Near beach as well. Friendly, helpful and polite staff. Big room. We stayed for 2 nights and it was near to the beach. The heater wasn't working well and the staff immediately sent the repairman to fix it. Helpful and polite. Comfortable hotel, breakfast was really bad, big comfortable room, friendly staff. Happy with all staff, friendly and 100% support if you need something.close to the beach. Large room and ocean view.very clean and fresh air if you want away from city to relax & enjoy holiday. Our stay was nice enough although being woken up at 5am with banging as loud as bombs was non stop. Totally unacceptable. When you come on a vacation and stay in a hotel, you appreciate a good sleep. When we checked out 2 hours early just to escape the noise we voiced our complaint about the ridiculous noise of the banging inside the hotel, receptionist did nothing atall, no apology, just pointed to a room and said 'working'. Also we rented a scooter, the hotels response was they were 'looking for the most high quality scooter for us'. This scooter they had supplied had the engine management emergency light on the whole time we had it. Furthermore the hotel was in the middle of nowhere and if u wanted to go anywhere the need for a taxi would be essential to to rent a very questionable scooter. The worst aspect of our stay was the lack of water pressure. Had to sit in the bath and hold the shower wand in order to wash. The shower curtain and the ceiling of the bathroom was moldy. The spa,sauna did not work. Besides that we had a good stay, the management and staff were very friendly. Good location, the room, in general, was in good condition. Nice balcony in the room. The staff were friendly and helpful. Breakfast was just so-so, and the food was not kept warm. Room cleaning was not totally consistent. There were days rooms staff forgot to provide towels in the room. The bathroom in my room was a bit below expectation for a 3-star hotel (although it was clean, it gives me the impression similarly to bathrooms in guesthouses). The only issue I had here was that the wifi was not working while I was there. The staff offered to give me a cable to connect in my room, but I decided I didn't really need access too badly and just ended up going online during lunch at a cafe down the street.